The government said yesterday it was ready to form a caretaker government with the United National Party (UNP) if it agrees on a general election. 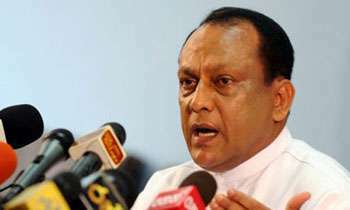 MP Lakshman Yapa Abeywardena said their ultimate goal was to hold a general election. “If the UNP is not in favour of going for an election when we are in power, we invite them to join us and form a caretaker government. Under a caretaker government which would be formed with the representatives of all parties, we can go for a general election. If the UNP agrees today, we are ready to do this without any conditions,” he said. The MP said Prime Minister Mahinda Rajapaksa would never object to an election and that he was not keen on holding on to the prime ministerial post. “If the UNP and others want to appoint someone else as the Prime Minister of the caretaker government, we are ready to accept that. However, the President opposed to Ranil Wickremesinghe as the Prime Minister. Therefore, the UNP might have to look for other options,” he said. Meanwhile, he criticized the conduct of Speaker Karu Jayasuriya and said the Speaker was acting with a ‘common candidate’ dream in his mind. Why should the legal government under Ranil agree with a caretaker government if it has the majority in parliament, which has been proven twice? Why What happened to your 113 Members ? Your can't form even a Care Taker Government Talking Big , Its right time to MS to resign and go to the Paddy field and do his Kuburra. Don’t agree. Why should the people accept a fake gov to be apart of a caretaker gov. First restore the legitimate gov and then negotiate early polls. The UNF should take the challenge as people are fed-up with the undemocratic manner in which MR was appointed. From now onward eating / making/using the word "hoppers" is banned in Sri Lanka until such time to be announce. Oh I see, finally he has thrown the towel into the ring! Is this all about UNP or SLFP or SLPP. When will they action on What the common man is needed. A good education for his kids. A good health care system. A good economy that will not burden him to go beg, borrow or steel. When we will have a leader who will look at these things. What we see now is just pure power hungry individuals wearing the democratic suit to get back into power and steal from the poor man. They never will understand that what goes around comes around. No thank you Dinesh. When you don't have the majority only your big man MR offers. I never ever thought you have such type of bright ideas..??? This is like you steal some once mo ey and then ask the victim to share with the thief.. wonderfull... good example for young generation... funny.. Yes because you have no majority you cannot be the govt. Alternative is to join with somebody and be there. Please let their turm end and face an election. Dont make this country a laughing stock. Why do you need a caretaker government when there was a legitimate government and your president messed it up. So now you have come to the point where you realize what has happened. Why don't to pack up and get lost with your Bungling pack of baboons you lame brained twit! They don't take care of anyone or anything other than themselves. It is a good suggestion for the sake of the country and for the citizens. Both parties should get together and move forward. At present we are moving backwards and it will take years to recover the damage done.Enough throwing rocks at each other. If both the parties get together we know that they are concern about the country otherwise they are more interested for their own interests and don't give a two hoots to the country. It is not a good suggestion because then we are forgetting the unconstitutional act of the President. First settle that. Now you are stuck and trying to play for draw. So MR will take care of what? What nonsense. If UNP agreed to this, I will not vote for UNP again. No point in voting for a spineless party. MOST OF MP'S WORKED UNDER RANIL WICKRAMASINGHE (UNP) INCLUDING YOU. ALSO MOST OF THE PEOPLE BORN IN UNP TO BECOME A MP. This is the best time to have Presidential election. All these political commotions were created by the President with the sinister intention of getting elected for the second term. The time is opportune to prove that the people are ready to accept the story of the President. YAPA .Go and do a job and make a living rather than living on the POOR mans lives . DISGRACEFULL . MR in live because of SF. SF now not with MR to save his life from MS.
UNP can TAKE CARE of this nation no need of a CARETAKER Govt with you THIEVES in it. yes...yes...somehow grab the power and ruin the county to the bottom, starting from where you have stopped...!! !